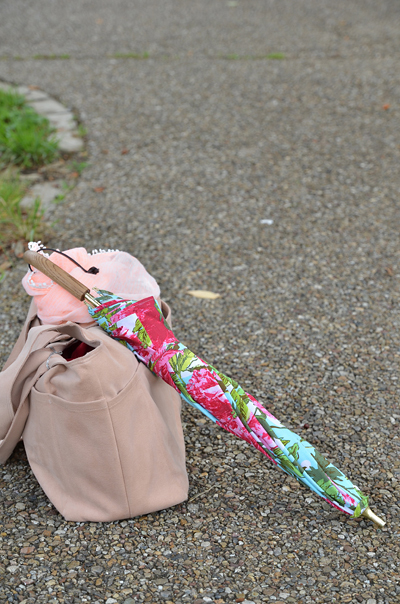 As I mentioned in the last post, here I'm going to share the pics that I took while I made two parasols. If technically said, I just reinstalled the canopies twice, though, I hope they will help you a bit when you wish to get yourself new parasols. 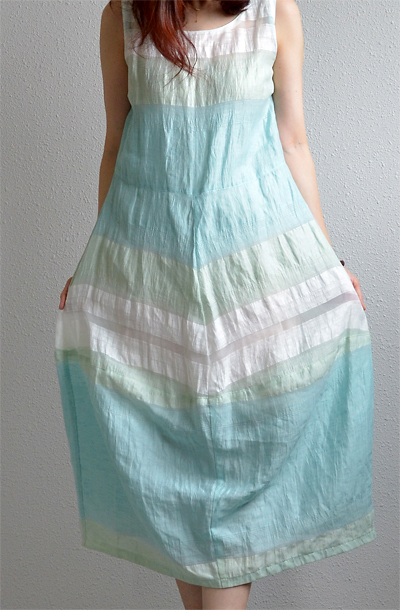 *As I made a pink version first and decided that I didn't like it, I made another in other fabric that I dyed in two shades of blue. I'm sorry for having too many pictures here, and also for the mixed version of pictures in order to complement my bad explanations. I believe having many pictures is better than relying on imagination, however. I took the canopy off my old parasol and installed new ones (plural, as I did it twice). What is most important is that taking notes along with pictures during disassembling to get the idea of the construction order. Constructing a new one is achieved by assembling it in the counter order to disassembling, basically. _Take notes about where and how exactly the canopy is sewn on the frame. 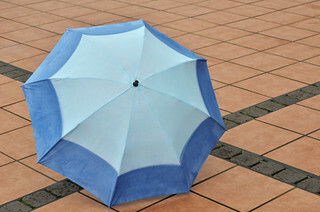 _Check the parasol top whether it is tightened by screw or it is bonded by glue. If it is bonded by glue or if it cannot be disassembled easily, the frame is technically not suitable for refurbishing. _Disassemble all accessories neatly and keep them for future use, or as a template of new canopy etc. 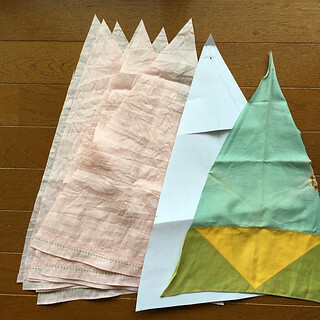 _Cut out one triangle from old canopy and use it as a pattern after making it flat. Check if the length of side seam of your pattern is shorter but nearly same as the length of the rib. They shouldn't be too different from each other. Said that, it's all dependent on the fabric. 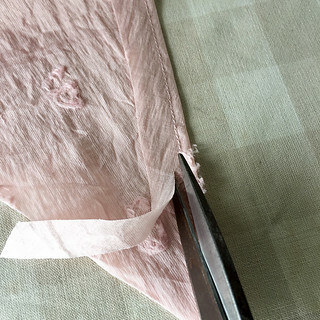 Some loosely woven fabrics or others with stretchy fibers may require to be cut much smaller. _Don't forget adding seam allowances when cutting. 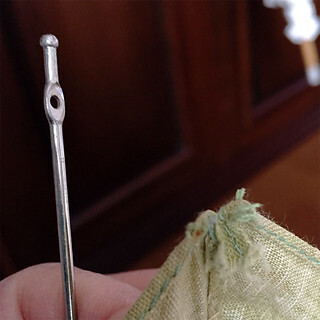 I find ~2cm(4/5inch) for side seam allowance is easy to handle in the later steps. 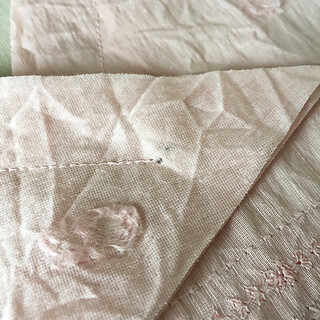 _Other fabric parts have to be examined and recreated if necessary. _I cut my canopy pieces in cross grain with the purpose for avoiding the whole canopy stretched out horizontally. 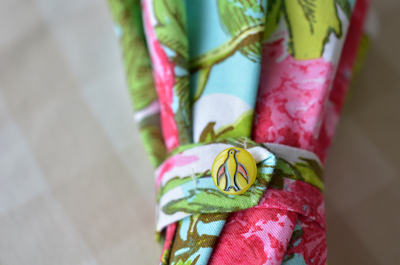 _My canopy pieces were cut with 2cm(4/5inch) seam allowance on all side seams. 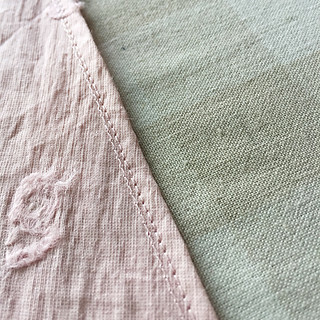 Hem allowance is up to the fabric. My one for pink version was 1cm. _Hem has to be done before jointing the canopy pieces. 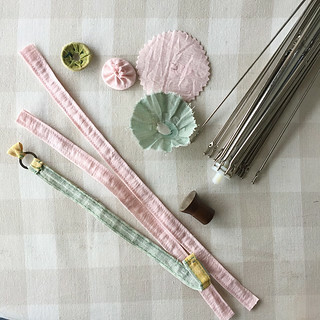 _Firstly make 4 pairs of pieces and sew them as follows. 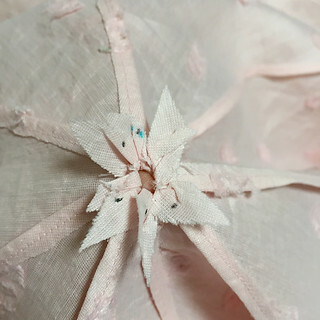 _Sew one of side seams with right sides facing, starting outer end(=edge) and ending inner end, stopping 0.1cm(>1/10inch) before the top of the triangle with secure back stitching. _Trim one of seam allowances leaving 0.4-0.5cm(1/6~1/5inch) to the seam. 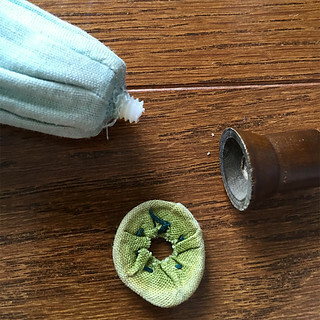 _Enwrap the trimmed seam allowance with the untrimmed one, like making a hong kong finish, and sew at a tiny bit outer side of the first stitch to close the trimmed seam allowance. _Trim the wrapping seam allowance leaving 0.2-0.3cm(1/10inch) on the canopy. _Sew 2 pairs of jointed pieces likewise, and repeat until all canopy parts are jointed. _Sew the closure ribbon on the canopy, probably you would like to do it exactly as the old one was attached. 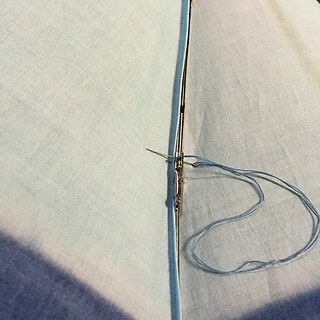 _Turn the flopping top seam allowances inside and press them neatly. _Place the inner round fabric part on top of the frame. 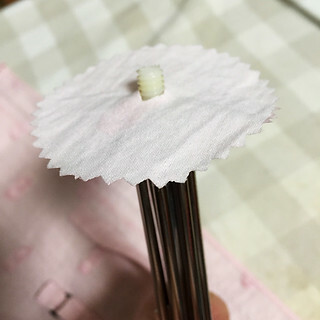 _Put the top round fabric part, and put the screw top on top of the parasol. 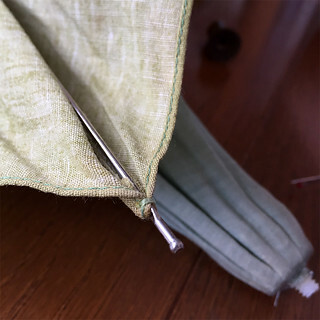 _Attach the canopy to the frame by sewing at all points where the old canopy was attached in the old parasol. Usually it is easier when tips were done first, and then to the ribs. The colors totally howl "Handmade" and I am kinda proud of it. 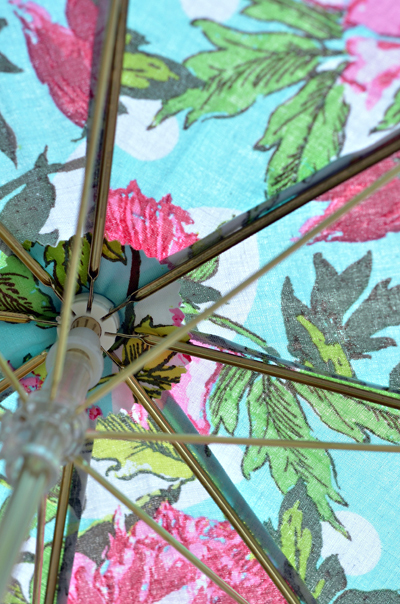 I think experiences tell you everything when thinking of making parasol. After trying one, you will know how easy it is. You will be getting the tricks and tips only after trying some of them by yourself, too. I hope you know what I mean. Good luck! *Here is a link to the album that contains these pics and also some other ones to complete a set of this topic for those who would like to see them all. I think this canopy was too tight. It was in 2009 that I made my first DIY parasols, when I wanted to make a birthday present for my sister. 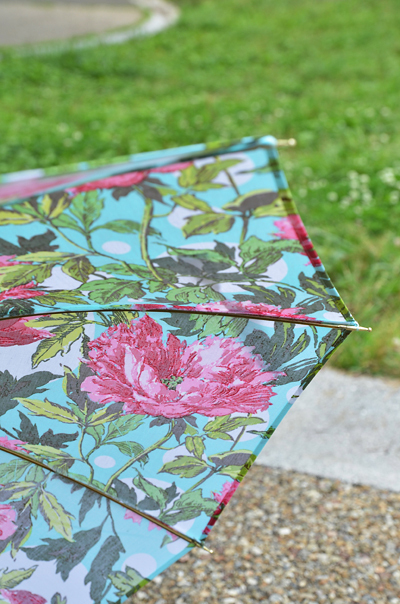 I made two parasols in Marimekko fabrics, one for practicing and one for my sister. Since then, I hadn't felt that I needed any more new one. However this summer, time is up. 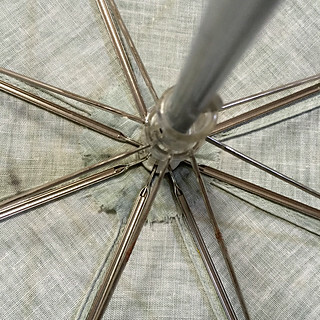 I think it is happening twice a decade that I need new parasols. It's a bit less frequent than I need new clothes. 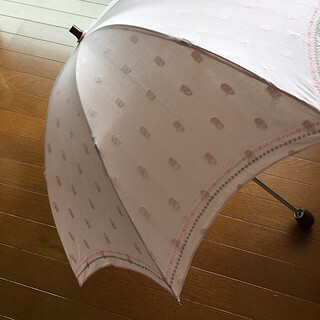 By the way, very many Japanese people, especially grownup women, use parasols to avoid UV ray in summer. We use sunscreen cream too. And we walk only on the sunshade-side of sidewalks. Mmmm, maybe it's only me to love the shady side, but I do so. I mean, I'm mentally sensitive to the sun. I am a fern, if not an UV sensitive bacterium. Only family and friends can drag me out to the sunny place, otherwise I'm a house plant. 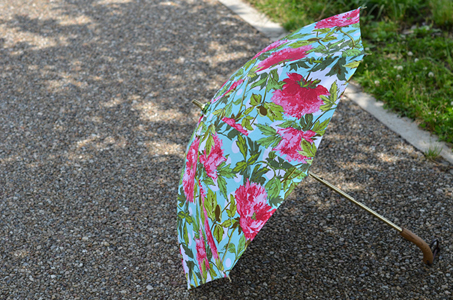 I used a DIY kit and my I-don't-know-why-I-bought-but-I-agree-it-is-pretty Amy Butler cotton to make this parasol. I'm ready for the sunshine! The thing is, I ventured to move on further a bit. 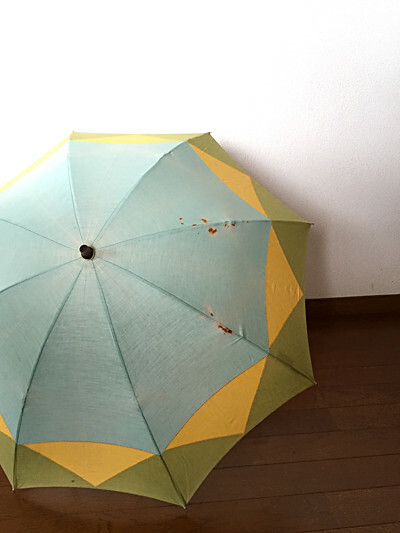 I mean, I tried refurbishing of my old parasol after this. I installed a new canopy (sewn by me, of course) on the old frame and I felt it was easy. That means I wouldn't need any more kit for my new parasols! I'd like to write about it in the next post, if not in the post following the next one. It won't be a tutorial, but I'm going to upload some photos to show my process so that you can see how it went. Please come back sometime later if you're interested. I hope you all are doing great. 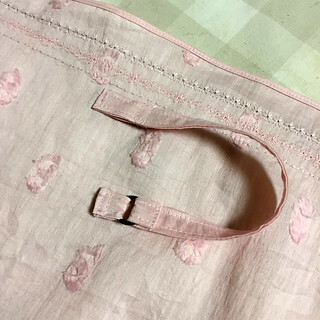 I've sewn a few easy garments since the last post in April, but I have been too lazy to blog about them here, too. I think I'm going to write some mini-notes about what I made recently spreading in some coming posts. 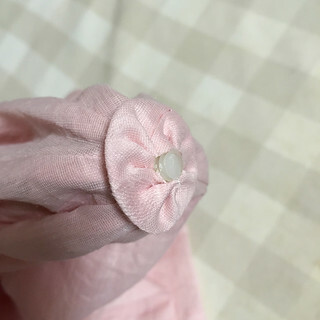 Please be warned if you look for something special technically in sewingwise, because they all happened after simple sewing (as always). 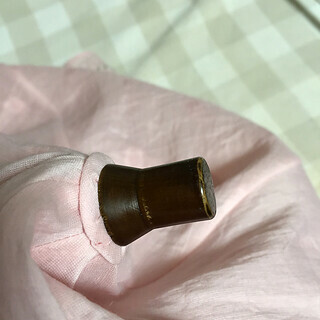 Bodice was lengthened by about 5cm at hem. Shallow bust darts were added to give some room in front. Lower skirt was shortened by 5cm. I chose size XS while my bust measurement corresponds to size M.
I like lower waistline, generally, so I lengthened the bodice. I wouldn't have shortened the skirt if I had enough fabric, though, I had no choice as there was a resource shortage of fabric. I have put some bust adjustment as I often do, but maybe it wasn't necessary. The size I cut was much smaller size than my measurement size, and I like the way it fits me. I need a wiggle to get in the dress, but it is easier than threading a needle. 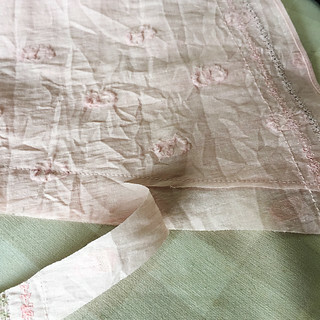 The fabric is light, slightly sheer generally, and very sheer at some particular rows of stripes. I'm wearing my handmade silk/linen short underdress in the pics. Sewing was quicker than stripe placement, as you may suspect. I was worried about stripe placement in this dress, especially in the skirt, but I now think the oblique line effect in the skirt isn't that bad after all. I really like the whole package of this dress. 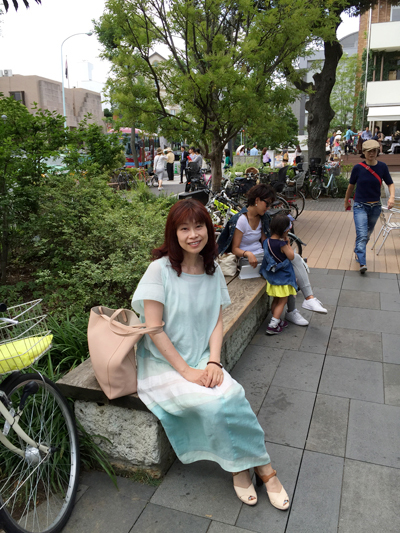 It is a comfortable summer dress, and I wore it several times already. Despite the fact that it's not summer yet. 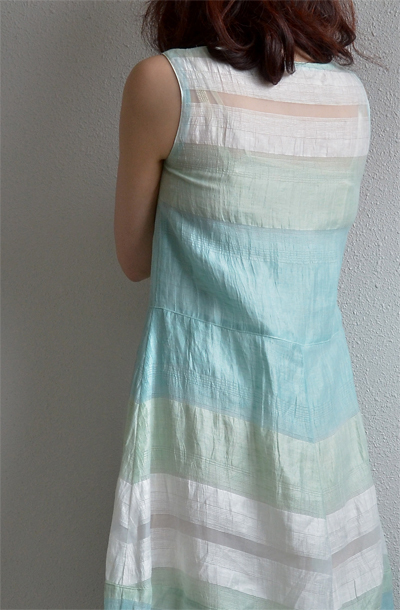 Fabric: 150cm wide x 200cm long, rayon, polyester, linen and nylon stripes, sheer and light. Not so drapey.